Ever heard the saying “some’s good, but more is better” ? That idiom certainly rings true when it comes to the capabilities of the multi-purpose server I began developing recently. The Triple Server introduced with this series initially supported http, mqtt and coap. Subsequently, coap was dropped and replaced with the addition of an Arduino interface. Web configuration was also introduced. There features are individually portable. When needed, they can be a great addition to many different IoT projects. FOTA password and network port settings are added to the configuration page options. When a FOTA password is specified, the user will be prompted to enter it prior to proceeding with a firmware update. A setting for the MQTT client id has also been included with this update. The past versions of this project simply set the client id to the MQTT username. Finally, a check-box has been added to enable MQTT password connections. 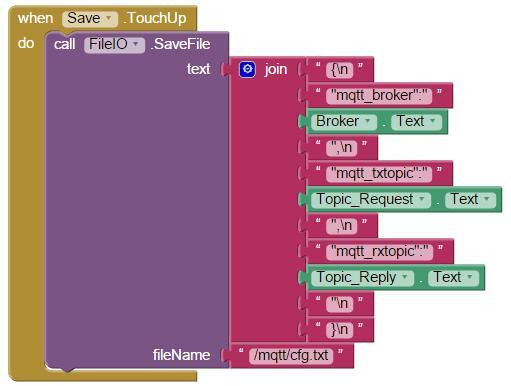 However, the remaining MQTT connection options specified in MQTT Version 3.1.1 such as a last will message have not been implemented in this project. There additional options were not considered essential for this application. The parameters updated on the Web Configuration page are passed from the html web code back the ESP8266 sketch code using an http “GET” request. Each parameter is added to the URL, a method that can easily be parsed by the ESP8266 c-code using the functions imported from the EspressIf SDK. This all worked well until special characters were introduced in a password string. In these cases, the special characters are URL encoded, which converts the special characters into something an URL will accept. For example, a space is considered a special character and gets converted to “%20” in an URL. The problem occurs when the parameter is saved. If “Hello World” is sent as an URL parameters, it becomes “Hello%20World”. This situation is resolved by using an URL decoder prior to saving the value. This restores the parameter to it’s original value, “Hello World” in this example. Firmware over-the-air (FOTA) is a very useful option to include with your sketch. The Arduino makes this capability very clean and easy to embed in your code. I found it very useful for debugging code, as it freed up the serial port for test messages. The drawback, however, is that FOTA reduces your effective maximum sketch size in half. This was not a problem in this project, which currently only uses 26% of the available 4MB of my ESP8266-12 flash chip. Just be aware if you are using an older ESP8266-1 with this project, FOTA cannot be used as the sketch uses more than 50% of the 512K flash installed on many of the older ESP8266 versions. A function was added and called in the setup() function. 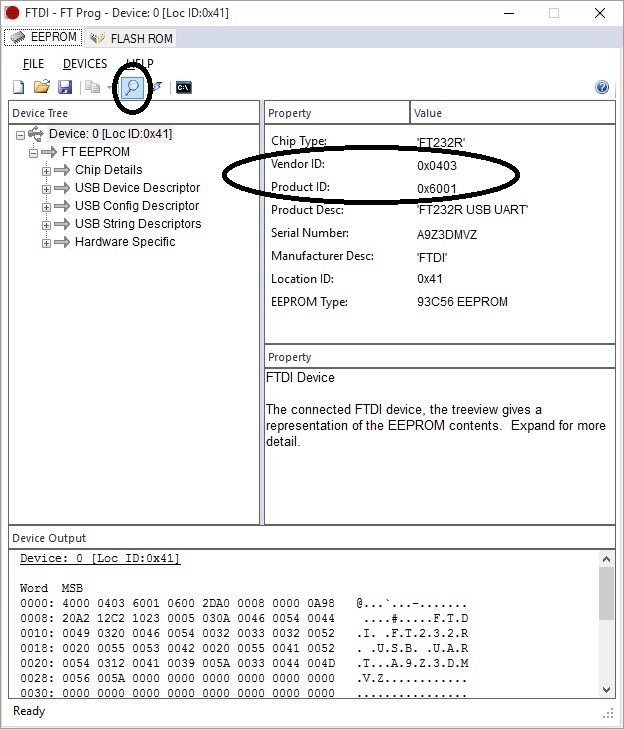 Note that the FOTA port and password values are set from values stored in EEPROM. That means they can be set from the application, so the sketch does not require modification to change the values. More on that when we go through the updates to the Web Configuration page. It a system is built using multiple devices, it may be desirable to ensure that each device sends and receives MQTT message over unique topic names. In order to link the MQTT topic to the ESP8266 device, the default topic now includes an expanded ChipID. That is to say, while the official ChipID uses the last 3 hex characters of the device’s MAC address, the expanded id in this application uses all six MAC address hex values. The implementation here simply appends the MAC to a topic prefix. The result is a topic name unique to each ESP8266 device. 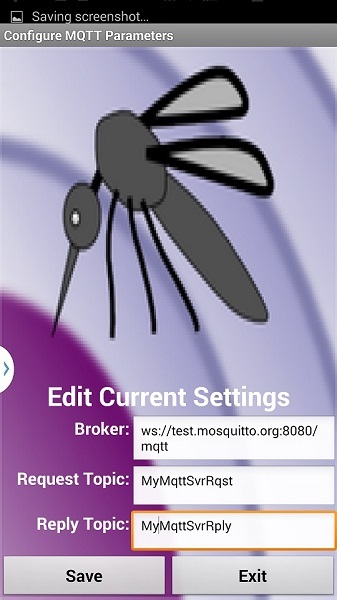 The initial design of the MQTT server in this project relied solely on the test.mosquitto.org broker. This simple test site does not offer the option of connecting with passwords. But, of course, a password protected connection is preferred. And recently, I had set up my own MQTT broker, with the capability to require username/password credentials with connections. So adding this to the ESP8266 based server was obviously needed. 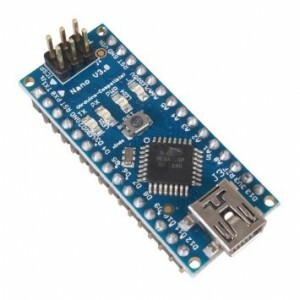 The Arduino server has been designed to query the Arduino for sensor or pin status. These queries are initiated from external http or MQTT requests. 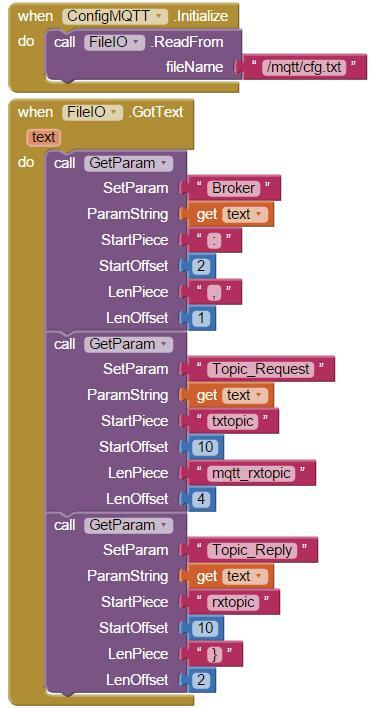 But this structure did not allow the Arduino to independently publish messages to an MQTT topic. That capability has now been added. 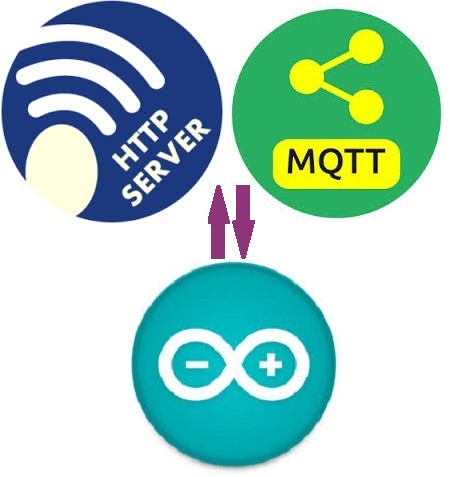 MQTT messages originating in the Arduino are now possible. Adding this capability required a simple restructure of the serial part data handler. Now, any time the end of line is received from the serial port, the ESP8266 sends the response to the http or mqtt channels when initiated, and to the mqtt topic when received without an initial request originating from the ESP8266. Instead, a new function, “MonitorSerialLine()”, was added to process all data received on the serial port, both initiated and unsolicited. The http response header requires an identification of current GMT (for the Date header) and a current date offeset (for expiration headers). Prior versions of this project simply added hard-coded, static values for these headers. While it did no impact the http response transmission, it was obviously inaccurate header content. In order to create accurate date headers, current GMT must be known. So time is now retrieved from a NIST server. This required an initialization routine to be run in the sketch’s setup() function. The offset is set to 0 so we get GMT when time is requested. The string returned from a call to ctime() is in a different format than what is needed in the http. The String class “substring” method is uses to re-sort the ctime() string into the needed http header format. This update establishes a solid framework for building IoT projects with both http and MQTT server support. While Arduino is used in the example, any external device with a standard serial link can also be easily added to this structure. 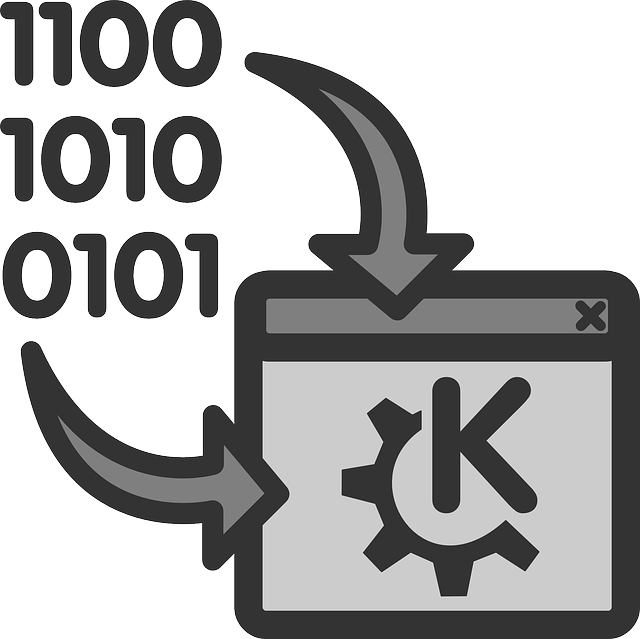 And when the system is deployed, updates can be deployed wirelessly, eliminating the need to connect a physical serial interface to the system. Here is the updated GitHub repository for this project. 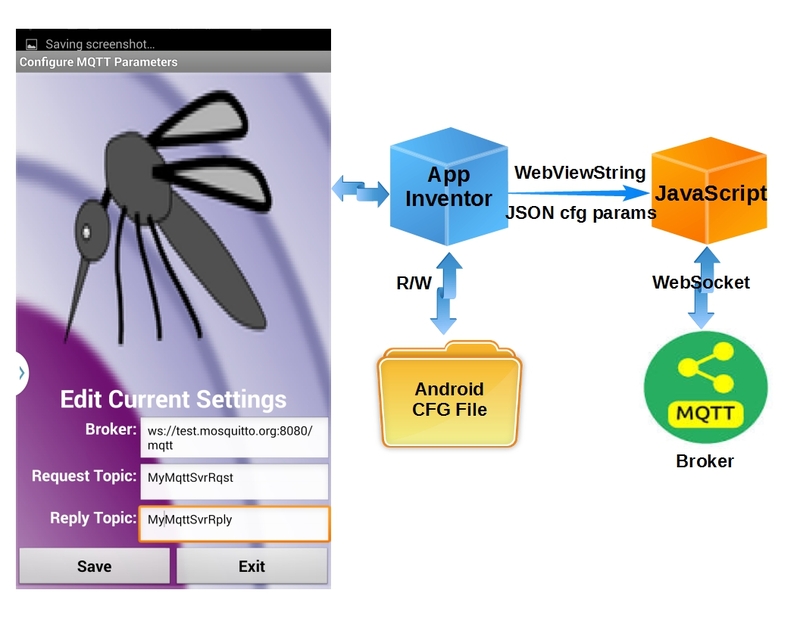 In my last post, a basic MQTT client portal for App Inventor was introduced. As result, there has been some interest expressed for TCP socket support. Note that the implementation presented relies on WebSockets. Due to security vulnerabilities, pure TCP sockets are simply not possible with this design. If TCP sockets are needed for MQTT communication at your IoT device, a broker capable of both WebSockets and TCP sockets should be used – Websockets on the App Inventor side, and TCP sockets on the IoT device end. 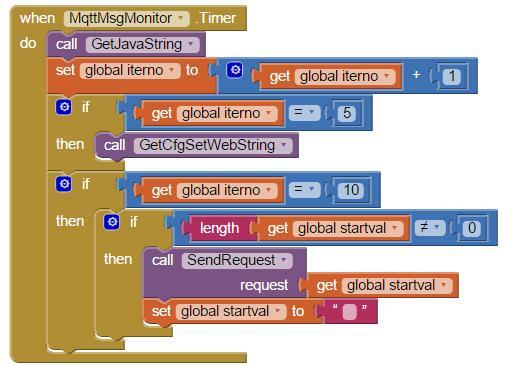 My next step was to refine the App Inventor project to support configurable MQTT setting. NOTE: If you just want to review and use the updated App Inventor project without the walk-through that follows, simply use the files provided in this Github repository. Broker: This can be any on-line broker, on your own network or either publicly or privately provided. Reply Topic: MQTT topic used to reply results to the client. Since this example uses the publicly available broker ‘test.mosquitto.org’, username/password authentication is not provided. You could easily be add this to the example provided here, however, if you are using a broker requiring authentication. When the screen used to edit the configurable parameters is open, it first reads the cfg.txt file, extracts the parameter setting, and uses those values to populate the screen fields. But when using App Inventor, there are no (at least none that I am aware) libraries available for parsing JSON. So I created the procedure “GetParam”, which extracts the cfg.txt values with 3 calls, one for each parameter. Two values are determined initially in order to extract the value. First is the position in the string that the value starts. The other value is the string length. These values are determined by using App Inventor’s string search (starts at) feature to find something unique (StartPiece and LenPiece) around the value wanted, and an offset from the parameter value’s exact position in the string. Once extracted, the “Edit Configuration” screen is populated with the values from this file. Saving the values is just the opposite. The values from the screen are formatted into a JSON string and then saved back to the same file, cfg.txt. As I have gained knowledge coding with the App Inventor, it became obvious that meaningful names were needed for project components. Much to my surprise, this does not extend to the main screen. It is called “Screen1” by default, and cannot be changed. The screen GUI was changed somewhat for this update. Two new buttons were added. One to open the configuration screen and one to exit the application. The components were also move to the bottom of the screen (don’t want to cover the mosquito, do we?). It is sent 1/2 second (500 ms) after the screen is open. An important note: I found that the command did not execute if initiated concurrently with the opening of the screen. So the 500 ms delay (5 timer iterations) was introduced using a timer, which works every time. A handler is also included for the first time this application is run. In that case, the cfg.txt file does not exists. As result, an exception is thrown when attempting to “ReadFrom” the file. An error handler was added for this condition. Error 2101 occurs when the file does not exist. In this case, a file is created with default values for the configurable parameters. The original project used hard-coded values for the Digital Get and Set commands. Ok for an example, but not so good if you need access to a channel outside the card-coded value. That was rectified with this update, which now supports digital channel selection. Select “Set Arduino Digital Channel” and a new screen is open. This screen allows you to select the channel to set. This screen is open with a “start value” received from the main screen that called it. The value returned when OK is clicked depends on the startValue. If it is a “Set” command, an Arduino SetDigital request string is returned. The selected channel and logic state from the screen’s selections are also returned with the request. Notice that a call to close the screen is made before the main screen (Screen1) is re-opened. That is necessary when returning a startValue. If the screen is not closed, it remains open for the duration of the App execution. Another call to this window will open another instance of the window. This is effectively a memory leak which will crash you Android device eventually. Takeaway: Close the screen before opening a new screen when passing a start value to avoid memory leaks. As you can see, a similar value is returned for “Get” requests. But when “Get” requests are received, the channel state is not selected, it is returned from the request. When this screen is open with a “Get” request, the channel state selection GUI is suppressed. 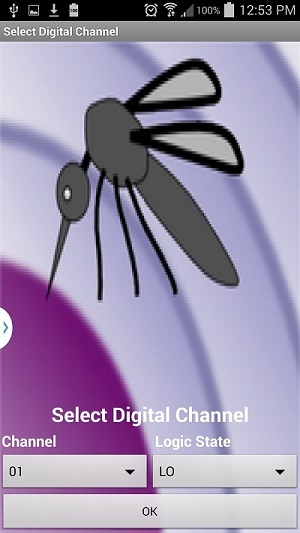 When the Digital channel selection screen is closed, the main screen is reopened. But how does it know to send the Arduino command to MQTT? After all, the screen is opened fresh, just like when the app is started. Not quite. Remember the ‘startValue’ returned from the digital selection? That is checked to determine whether an arduino request is needed. It is done in the 100ms timer callback. Just one more thing and we are done with this update. I thought it would be nice to add an ‘Exit’ button to close the app. What I found was that it required several clicks before the app would actually close. What was happening was that every time a different screen returned to the main screen, the previous main screen remained open and a new main screen instance was created. Not exactly what I had in mind. Another memory leak! This was corrected by adding a ‘close screen’ before each time one of the two added screens was open. This guarantees only one screen is open at a time while the app is running. With this correction, the Exit button works as intended, with only one click required. 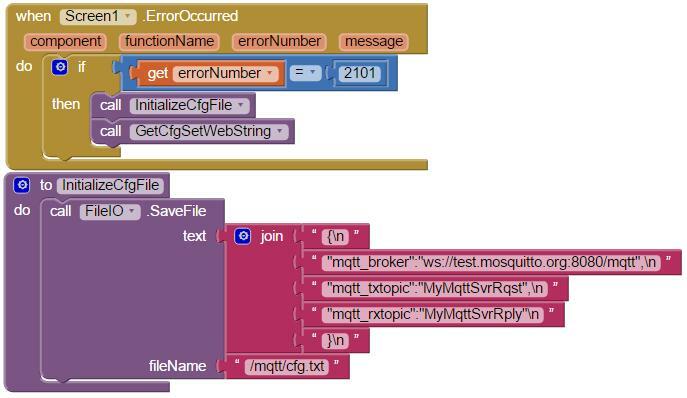 This example should provide a framework for anyone needing to use MQTT with an App Inventor project. The main caveat is that a broker that supports WebSockets is required. 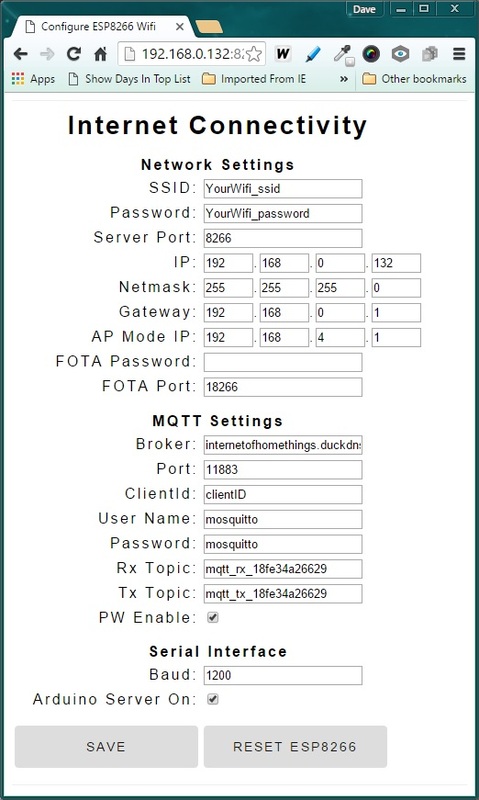 I leave it up to you as an exercise to add username and password credentials to the mqtt connection settings. The basic structure is here. And it should also be a simple task to add “GetAnalog” to the Arduino request options. Go ahead, you can do it! If you need it. Again, here are the project files. There were some basic enhancements needed to my Triple Protocol Server. But in the process of implementing the updates, the limitations of the ESP8266 resources were reached. To make room for the new features, something had to go. In this case, the CoAP server was eliminated. The choice was obvious. This protocol consumed a large chunk of the available heap, leaving little room for program execution. As result, the system became unstable. CoAP also does not lend itself easily to web browser based clients. So with that gone, a valuable new feature was added. A light-weight modification that did not significantly burden the system. Something that Arduino users should find extremely useful. What? We already have access from the Arduino using the AT command set. “So what’s so special about this?”, you say. Well…this implementation removes most of the web server tasks from the Arduino and puts it in the ESP8266. The only thing the Arduino needs to do is read small strings (requests) from the ESP8266 and return a small string back. This frees the Arduino to concentrate on sensor readings and control functions. This balances the load on the two micro-controllers, reducing the load on the Arduino while fully leveraging the available power of the ESP8266 as a web server. It’s really quite simple. The ESP8266 web server is already in place. All that is needed is a few new URL-based (or MQTT topic payload) commands to provide web-based access to the Arduino resources. The commands are parsed and decoded by the ESP8266. The command is reduced to a small string that is passed to the Arduino for action with it’s hardware resources. The Arduino returns a reply to the ESP8266, which, in turn, is returned to the http or mqtt client. 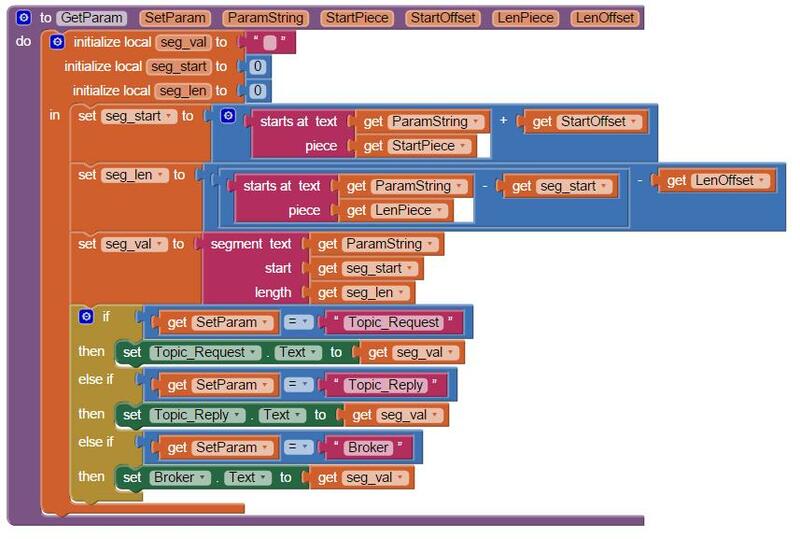 This structure is similar to the slash (/) delineated bridge interface used with the Arduino Yun to communicate between it’s Arduino and Linux processors. Instead of using a pricey Arduino Yun, you can use any model Arduino along with the very inexpensive ESP8266. In this test case, I used a $7 Arduino nano clone. The example presented here only includes the basic digital and analog access to the Arduino. 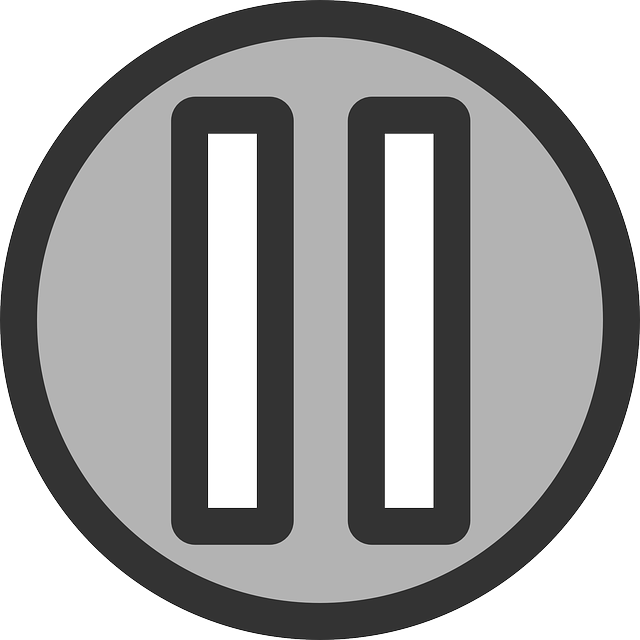 The digital interface is obvious, setting or reading the state of each pin. The analog channel reads returns a voltage between 0 and 5 volts, based on the 10-bit Arduino ADC channel reading. From this command set, it should be obvious how to expand it to include bus oriented sensors such as 1-wire temperature and i2c connected devices. The ESP8266 Arduino IDE sketch is based upon my triple server sketch presented in a prior post. The default parameters are defined at the top of the sketch in the section titled “Initial EEPROM Values”. These can be revised to match your network setting as described in Part 2 of this post, and in the sketch’s github repository. 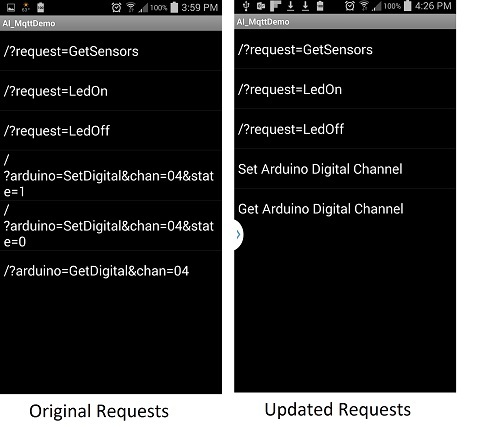 A simple Arduino sketch is provided here as an example of how to receive and process requests from the ESP8266. Using the low-end Arduino nano, this example uses a software serial port (Arduino digital pins 10 and 11) to communicate with the ESP8266. Due to the limited bandwidth for reliable operation with this software port, the baud was reduced to 1200 baud. If a dedicated hardware serial port is used, such as found with the Arduino mega, the baud can be increased considerably. The example provided is fully functional, yet simple enough to understand and build upon with even modest programming skills. So there you have it, an ESP8266 web server sketch that supports Arduino communication using either MQTT or url-based http protocols. But there is more to this update. 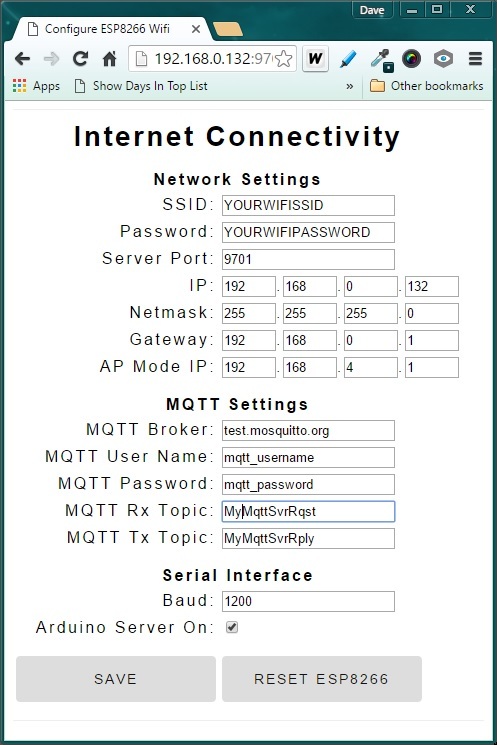 I’ve also added web-browser configuration of the Network and MQTT settings. Here is an exciting framework for fully utilizing the huge capabilities of the ESP8266. Most folks in the ESP8266 world seem to fall into one of two camps. The first group, typically diehard Arduino developers, want to use the ESP8266 as a serial to WIFI shield. A couple bucks to add WIFI to the very popular Arduino platform is most cost effective method of bringing it on-line. Much cheaper than alternative WiFi shields. Others see the ESP8266 as a complete solution. It is often referred to as a System On a Chip (SoC). They not only use the ESP8266 for WIFI internet access, but also use the platform to read sensors, control “things”, process data and provide web server functionality. The majority of those that have delved into the ESP8266 world started by loading the serial to WIFI firmware often referred to as the AT command set. This is available as a binary file downloaded to the ESP8266 via it’s serial interface. That’s where I began my ESP8266 journey. It was not long after my start that I searched for the AT firmware source code. Fortunately, it is available within earlier versions of the EspressIf SDK. You see, prior to version 1.0, many example applications were included in the development package. And yes, the AT command set was among these examples. The other most useful example application is the IoT_Demo. This software has survived every release of the SDK, including the current version. This example provides a framework for a web server to make your “things” Internet accessible. Wouldn’t it be great to merge these two applications? So you benefit from both features? It indeed did look feasible. The combined application would not only service AT commands through the serial port, but also service http GET or POST commands via the Internet. This single ESP8266 firmware application could also be used to read sensors and control devices. I am stoked to say I have successfully merged these examples. This broadens the capabilities and applications of a single ESP8266 based system. The ESP8266 is used to perform 3 primary functions. First, it provides basic serial to Wifi capability using the standard AT command set that many first-time users tinker with. Note that since the design presented here includes the AT firmware source code, the command set can be expanded to also provide access to the Esp8266 Daq and Control features. This is depicted in the following diagram as two-way arrows from the AT Server. The ESP8266 also provides Web Server functionality. 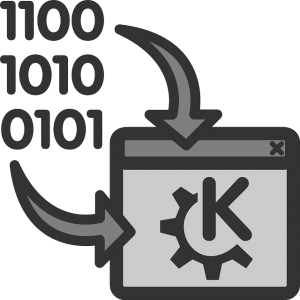 This feature operates completely independently from the serial AT Server. The web server responds to http GET commands received form the Internet via the built-in Wifi capability. Just like the AT Server, the Web Server has access to the Daq and Control functions. And finally, the data acquisition (DAQ) and control function, also running independently from the other two features, controls all the Esp8266 outputs and receives all the sensor inputs. 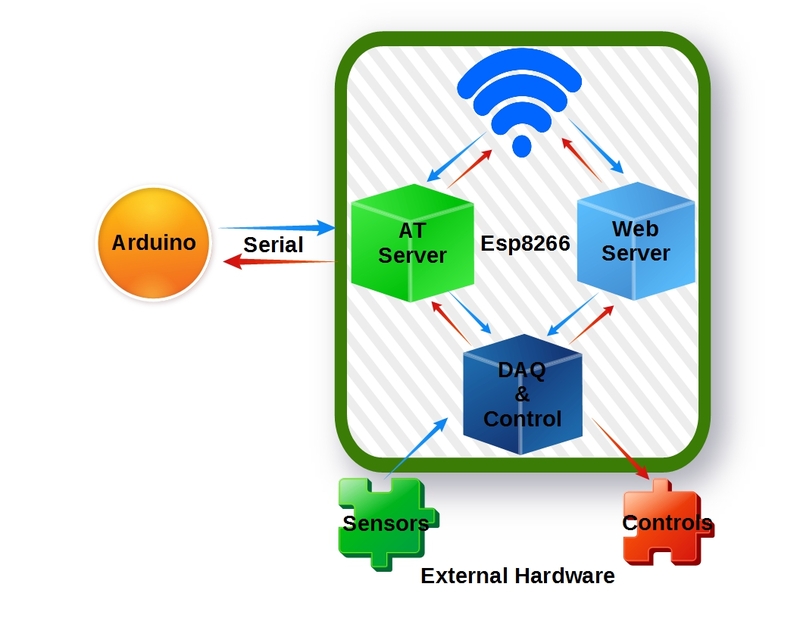 Because of the many possible sensors connected to the system, the DAQ function must be managed so that it does not monopolize the Esp8266 processor. This is accomplished by limiting it’s execution to the reading of one sensor each time the function is called. Separate callbacks are registered for each of the three ESP8266 primary functions. Both the AT and Web Server callbacks are event driven. They are only executed upon user request. The AT callback is executed anytime data is received on the serial port, while the Web Server callback is run upon receipt of an http GET request. The callback for the Daq/Control features are different. 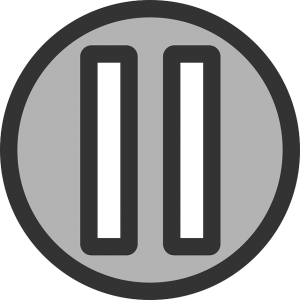 This feature is set up to execute periodically (once every second) from a Timer callback. This keeps the sensor data fresh, available for consumption by the AT or Web Server, upon request. AT Callback – The AT serial port server callback is installed in the uset_init() function when at_init() is executed. The AT server responds to any of the requests defined in at_cmd.h. The new request, “+GETSENSOR”, has been added to provide a method for the serial port server to get the sensor readings. Upon receiving this request, the function at_exeGetSensorVal() is called. This function returns the current sensor reading over the ESP8266 serial port. “n” is the sensor number and corresponds to the case number in the code above. As you can see, it is not difficult to add your own custom commands to the standard ESP8266 AT command set. Web Server Callback – This application uses the Web Server code provided in the IoT_Demo example. The user_init() function sets up and connects to the local Wifi before launching the Web Server. The callback webserver_recv() is registered during the initialization sequence. That function is executed any time an http GET request is received. For this demo application, the Web Server only responds to “request-GetSensors”. More requests can be added as noted in the code that follows. When received, the server replies by sending a JSON string containing all the sensor readings. Acquisition/Control Timer Callback – This callback serves as the application’s periodic loop() function. It is called once every second. The functions is mechanized as a state machine. In this example, 5 states are implemented, one for each sensor in the system. Exactly one state is executed each time the function is called. Upon completion of the sensor read, the code is set to execute the next state the next time the function is called. The code can be modified as needed to add or delete states and sensor hardware. Want the code for this framework? Please feel free to use and modify it for your own custom requirements. It is available on Github here. Let’s test the dual server by sending a command over the serial port and via http GET. The command will retrieve sensors values read by the ESP8266. For this test case, the 1 second loop() function has been modified as follows to populate the sensor variables without actually reading any sensors. Your demo application is working properly if the expected responses are observed. This opens up new possibilities. With this structure, you use the ESP8266 as an Arduino serial to WIFI shield. Yet at the same time use this same ESP8266 as a web server. And a sensor acquisition engine. And to control “things”. All you need to do is add meat to the bones provided here. What will you come up with? Do you have an Arduino Nano that is non-operational? Failing to upload sketches? Behaving basically as a dead device. Non-responsive. Essentially a brick. My Nano started behaving that way when I pulled it off the shelf to help someone with a project. This became another problem to be solved. It had to be corrected before using the device again. So I searched for an answer on-line. It soon became clear that the root of the problem was the FTDI USB-to-serial conversion chip. Everyone was offering the same solution. But, unfortunately, none of the information I found worked for my unique case. You see, my first attempt at solving this problem, in reality, made things worse. The contents of the FTDI flash had been altered. Making it unrecognizable and inaccessible. I had to come up with an answer to that issue first before addressing problem most users had been experiencing. After much research and failed attempts, I have now come up with the complete solution. You may not need to do all these steps, unless you corrupted the nano’s EEPROM as I did. After several unsuccessful attempts at uploading a compiled sketch, I had a closer look. The first thing to do was to monitor the devices serial port. This interface (USB at my PC) was spewing “NOT GENUINE DEVICE FOUND!” endlessly at 115200 baud. After some thought, I concluded that somehow the device claimed to be “Arduino-compatible” was in-fact, counterfeit. And somehow, the driver used to communicate with it’s FTDI interface chip knew it. Blocking it’s normal operation, replacing it with the message I was observing. As it turns out, this “blocking message” was placed in the driver by the OEM, FTDI. Since everything worked initially, going back about a year and a half, but not now, a driver update had to be responsible for this new, unwanted behavior. From what I had read, the problem was that the “updated” driver had a method to detect “non-genuine” chips. In those cases, the USB device descriptor ProductID (PID) was altered from 6001 to 0000. The trick was to change the PID back to 6001. Fortunately, FTDI provides a utility to do just that. It is called FT_PROG, available here. Changing the PID was easy with this program. Just start it with the nano plugged in, click on the scan icon, and your nano device settings are displayed. Just play with this program a bit and you will figure out how to change the Product ID. The Vendor ID was set to 0401 in the article and mine was 0403. So I changed the nano VID to 0401. And that’s when things got really bad. IMPORTANT: DO NOT CHANGE YOUR NANO’s FTDI chip Vendor ID. With the VID modified, the device driver no longer recognized the device. And the FT_PROG utility could no longer find the nano. There was no way to change it back. It appeared that the device was now permanently bricked. Useless. Unless the Vendor ID could be restored to the original value. A review of the FTDI driver .inf files (ftdibus.inf and ftdiport.inf) uncovered the presence of many instances of “VID_0403”. I thought that changing it to “VID_0401” would make it recognize my altered FTDI device on the Arduino nano. When attempting to install the driver, an error message popped up suggesting the driver had been tampered with. OK-OK, I changed the Vendor ID! The error occurs as result of a mismatch of the digital signature files (*.cat) with the driver files (*.inf). No problem, just delete the .cat files and the driver installation should work. I was expecting a warning that the driver did not have a digital signature with “want to proceed anyway”, but that was not the case. It would not allow the installation to finish without the signature. All that is needed is to disable driver signature verification. Instructions on how to do that can be found here. With the signature verification disabled, I was able to install the driver with my modified (*.inf) files for the altered VendorID. This restore access to the FTDI device with the FT_PROG utility. The VendorID was then revised back to the correct value, 0403. But I was still unable to download sketches to the nano. In order to restore the original functionality to the FTDI chip, an older version of the driver must be installed. A version prior to the one FTDI released to brick “non-genuine” chips. You can get version 2.08.30 WHQL Certified here. Scroll down to the “No Longer Supported” section to find this older driver. Download the zip file so can revise the *.inf files as needed. This driver will work to unbrick your FTDI device. But first the existing driver must be removed from your computer using the FTDI CDMUninstaller tool. This tool should be self-explanatory. One more consideration. Windows regularly checks to see if any of your drivers are out of date. If your FTDI driver gets updated, possibly automatically, you will be right back where this all began. With a bricked device. Having a bricked device is always an unsettling feeling. Yet like most challenges in this DIY game, there is usually a remedy. Sometimes it takes some persistent effort to make things right. But what a relief when things are made whole again. Rest easy. Armed with the solutions presented here , you now know how to make those cheap Chinese clones behave as intended. After playing with an Arduino for a while, collecting sensor data, the logical next step is to add a method of saving this data for future consumption. You cannot get access to the data unless the Arduino is running, and you are located in the same area as the system. This approach, if relied solely for data storage, keeps your system isolated, Not exactly an IoT solution. Saving the data somewhere independent of the hardware that first acquired the information makes more sense. In the cloud if possible. Many turn to ThingSpeak. This free service supports up to 8 updates at a time. The API uses a single http “GET” request for this purpose. The strings are typically 100-150 characters long, data dependent of course. No problem, right? Since the Arduino often uses a serial to WIFI device (like an ESP8266), all you need to do is write the string to a serial port. A very simple one-line sketch command. Yet there lies the essence of the problem…. You see, the Arduino Serial port buffers only hold up to 64 bytes by default. Try to send a string longer than 64 bytes and it will be truncated. Cut off at the buffer size. Not exactly what you want. I’ve run into this and found that there are two different solutions. The one to use depends on whether you are using a hardware or software serial port. It is important to note that these changes are at the Arduino core level. This means that every serial port used in all your projects are effected by this change. These minor file changes need to be undone for projects that work just fine with the default 64 byte buffer size. The reason you may not want to expand the buffer all the time is that the buffer consumes valuable Arduino RAM. An ATmega328 based Arduino, typical in many models, only has 2048 bytes of run-time RAM available. With two separate serial port buffers (on for Tx, one for Rx), changing the buffers from 64 to 256 bytes increases the RAM requirements from 128 bytes to 512 bytes. That is a full 25% of the available RAM for your entire sketch. The Arduino Mega is the model of choice if extra RAM is important. This beast sports the ATmega2560 chip which provides 8192 bytes of RAM and 4 hardware serial ports. I hope this information proves to be useful….